MARTI MITCHELL-Perfect Patchwork templates for quilting in the style Drunkyard's Path. Package includes: 4 quarter-circle templates for making 3 or more sizes of Drunkard's Path. Use the templates in pairs to make Drunkard's Path. 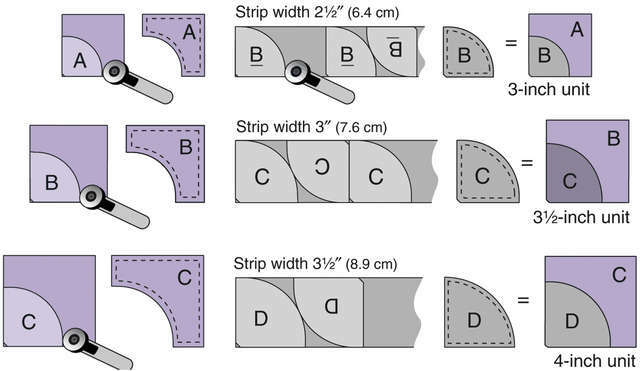 The L shape is cut from a square that is the desired size of the pattern unit. The smaller template fits into the corner of the square for rotary cutting to create the L shape. The larger template is used to cut the matching pie shape. Perfect shapes and sizes- laser cut accuracy-specific size pieces, perfect 1/4 seam allowances already added, perfect corners-not just blunt, but revolutionary double blunt corners engineered for perfect alignment. Also great for rotary cutters-cut multiple layers at one time. Perfect for hand or machine piercers.